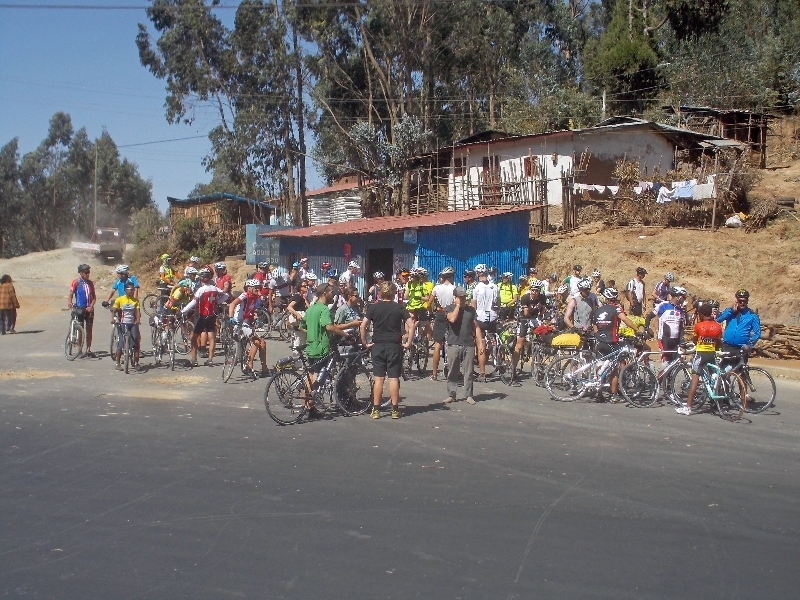 Today was a hilly ride that got us into the capital city of Addis Abada, population 3.5 million. While the morning had been described as “rolling hills”, there was a bit more hills than I had expected. Still a beautiful ride. We awoke to cold temperatures, some cyclists reported around 4C (39F) in their tents, and everyone was a little slower getting up. Fortunately as the sun peeked over the horizon and we had a 4km climb to start we soon got through that cold. The next 20km were actually flatter as we mostly crossed a plateau including a few small towns. Monday morning and school children were out with books, though I couldn’t quite figure out where exactly they were going. We had a village at 24km and from this point to lunch at 66km the “rolling hills” were much longer, descending from one elevation and then climbing up to next point and repeating this. Near top of one of these hills I took image above of the fine shrine. 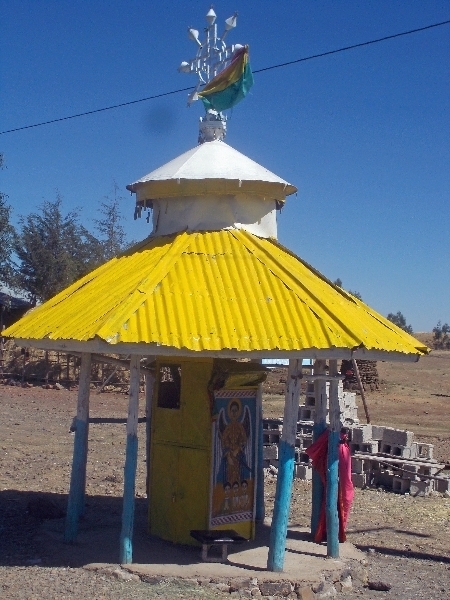 This seems to be more Coptic area with both simple shrines and more ornate churches. 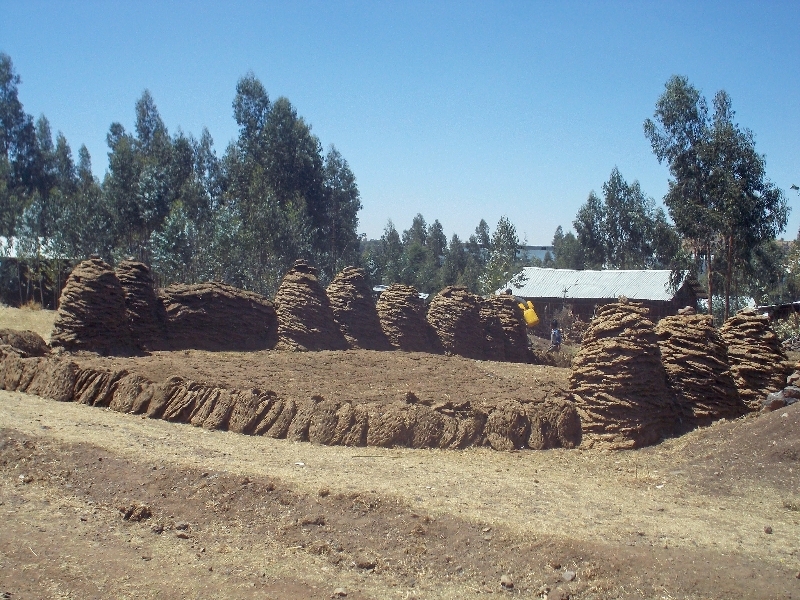 As we passed through one town, saw these piles of dung carefully dried and then stacked together. We will also often see them next to houses in countryside, sometimes large groups of them. The climbs and descents were challenging but without too much trouble, made my way to lunch. 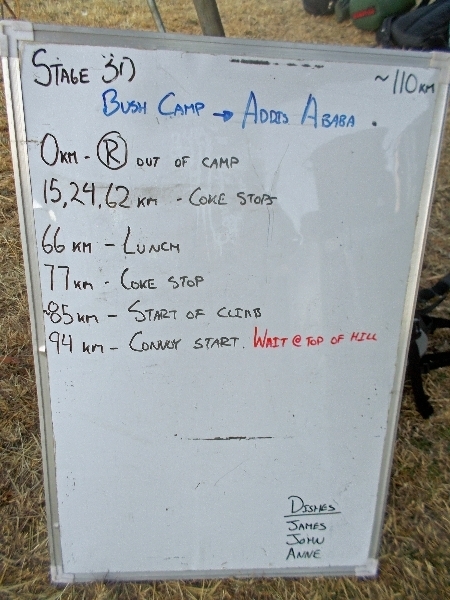 I wanted to make sure I didn’t stop too much since at end of day we would synchronize with a convoy into Addis. After lunch, the route was actually flatter as we crossed one large town and then had some climbing to final ascent point into the city. It was about 3pm as everyone collected together. Our final entry into the city would be on major roads and mostly all downhill. I opted to take the truck since I had ridden 94km and descending tend to be cautious. That was probably a mistake as in bizarre accident, I ended up chipping a tooth slightly. Better safe than sorry and so with another ride that needed to visit the dentist and a recommendation from local Ethiopian riders – found a good western clinic and had it looked at. Interesting experience to go through the city and then end up at fairly modern and western dental clinic. We now have rest day in Addis Abada. We’re a little ways from middle of city, so probably mostly relax, clean and tune up things here at camp.